two weeks in – failure? The JUMP bike share system was rolled out for Sacramento, West Sacramento, and Davis two weeks ago, on May 16. I was very excited, as I’ve used the JUMP system in San Francisco a number of times, and have used the non-electric SoBi (JUMP was formerly SoBi – Social Bicycles) here and many other cities. I’ve been watching the bikes and app during the two weeks, and used the bikes occasionally. Let me be blunt – the system is failing. There were supposed to be 300 bikes at roll-out, another 600 later, but there were never 300 bikes out, and there are far less now. More than half the bikes I see are ‘in repair’. Some of these may actually be in repair for maintenance reasons, but if so, it doesn’t bode well for brand new bikes that they are breaking down so soon., I strongly suspect most of them have batteries to low to operate, and the bikes puts itself into repair mode rather than letting the battery get run down completely. I’ve seen bikes in repair be in the same place several days later, still in repair. While out this evening looking at hub locations and bikes, I saw four young people get dropped off at a hub with four bikes by a ride hail. They were excited about using the bikes, until they discovered that only two of the bikes were working, the other two were in repair. They were stuck. I bet that they won’t use the system again. I saw another bike on the app, and tried to rent it, but after quite some time, the display said the bike was not available. What does that mean? Why? It was not in repair, it was not on hold, it just wasn’t available. I tried it three times, same result. I’m seeing little rebalancing going on. There are almost no bikes in downtown/midtown, what bikes there are are scattered around the edges. This is not a daily flow of bikes in and out of the central city, rather, the bikes have gone out of the central city and are not returning. I found two bikes that showed up on the app but the bike itself said they were on on hold/reserve, but neither actually were. They had been unused for more than an hour, probably all day, and supposedly bikes can’t be placed on hold for more than 60 minutes. Since they were on hold, they could not be rented through the keypad. However, I was able to reserve one of the bikes, and then rent it, so it wasn’t really on hold. I rode that bike, taking it back to a hub, and locking it, with the display showing the rental finished and the bike again available. But the app still shows the bike in use, and is accruing time against my account. Did the bike put itself into hold? Not sure yet, still waiting to see what happens. After an hour and a half, getting tired of being locked out of the app, I went back to the bike. 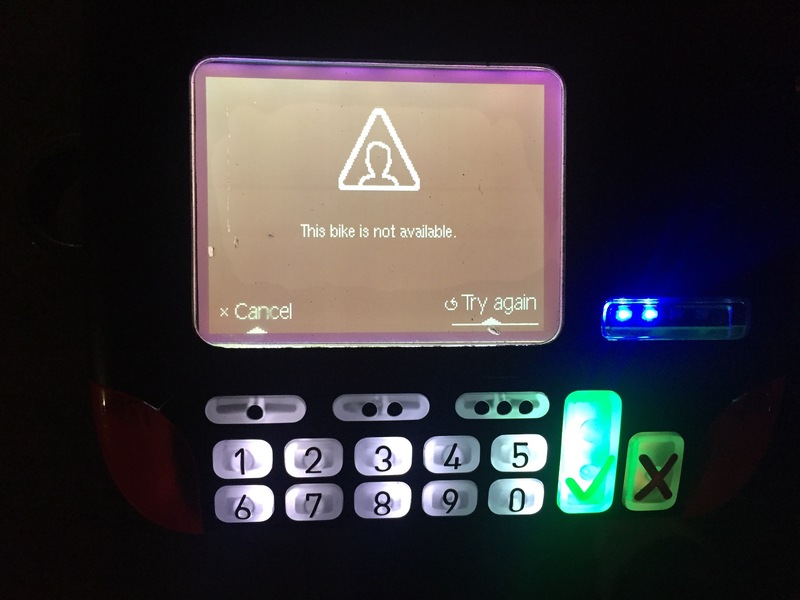 The keypad said the bike was on hold. So I put in my code, and it said the bike was in use. It cancelled itself out after a few minutes, but the app was still counting. 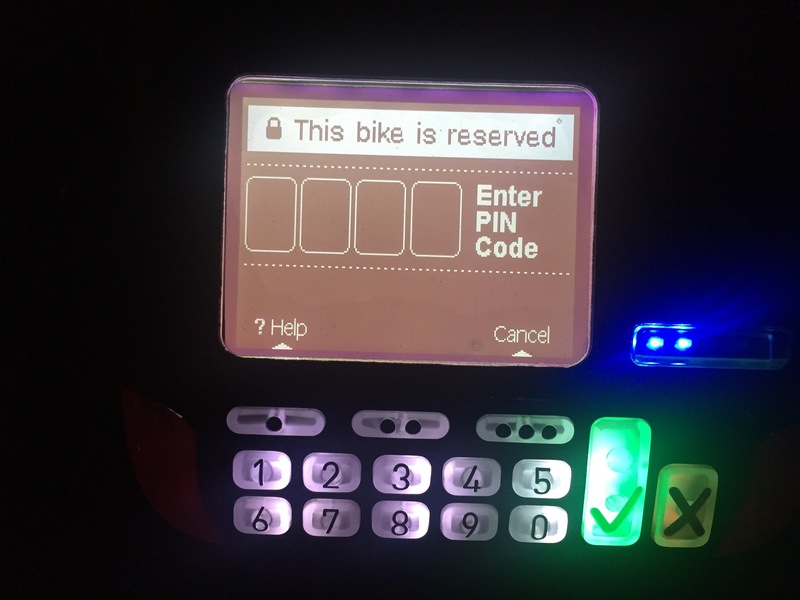 So I rented the bike again (remember, the display said the bike is available), The app started counting at 43 minutes. I locked the bike and the app finally let go and returned to the map. I can’t see how much it cost because the app is now locked into JUMP SF, and there is no way to change it to JUMP Sacramento. Interesting, you can use http://app.socialbicycles.com to switch between systems, but the app won’t let you switch. At 4:00AM, well past the time when it is likely that any bikes would be in use, I count 54 bikes in Sacramento (only 16 in the central city), 11 bikes in West Sacramento, and 32 bikes in Davis, for a total of 97 bikes. If there really were 300 bikes, that means that more than 2/3 of them are out of service.